The perfect heart gift -- charming, nostalgic, and sweet. Filled with Dorothy's swiss chocolates Deluxe Assortment. 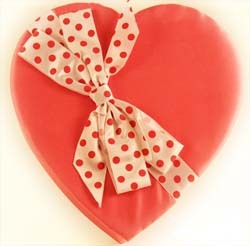 The heart may look sweet and dainty but its extra large 1.5 pounds are spectacular! This gift is sure to please your Valentine! Dimensions: 11 1/2" x 11" x 1 3/4"
From Ken of Orwigsburg , Pennsylvania on 2/20/2017 .